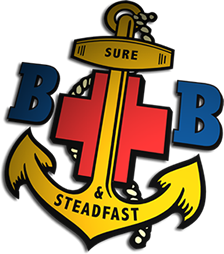 Welcome to the Worcestershire Boys' Brigade Battalion website. Have a look around and find out more about us and the work we do. The Battalion Scripture Competition for the Company/Senior section took place on Monday 19th March 2018 at 1st Kidderminster. Only two Companies decided to enter and they were 1st Kidderminster and 1st Lye. There were a number of rounds in which there questions from set chapters in the New Testament and also questions from other parts of the bible. Also the youngest person in the team had to write down the memory verse. After a number of rounds which were closely scored between the two teams it was 1st Kidderminster who came first with 1st Lye coming a close second. There was an Officers team but we wont mention their score. Well done to both Companies for taking part. On Saturday 17th March the Anchor Easter event took place at 1st Kidderminster. In total there were 28 Anchors from nine Companies that came to enjoy the event. As the Anchors arrived there was various games. The Anchors made Easter cakes decorated with eggs and made with chocolate rice crispies. There was a Easter egg hunt in the church followed by some Easter colouring sheets. They the made Easter baskets to put their cakes and egg in. To finish the event they had something to eat and before going home they were presented with a large Easter Egg and a Easter story book. 1st Redditch and run by Junior Section Secretary Ben Phillips. There were 16 Juniors from 1st Redditch, 1st Kidderminster, 1st Halesowen and 2nd Bromsgrove. The afternoon saw the Juniors attempting 10 Challenges on a individual level and split into first, second and third year sections. The challenges were set to test the Juniors with co-ordination, memory, aiming and other skills. The medals were given out along with a certificate to each Junior. The Anchor Christmas party took place on Saturday 2 December 2017 at Droitwich Spa Baptist Church. There were over Anchors attending this event from Companies across the Battalion. The Anchor enjoyed themselves having games, craft and tea with Santa. Certainly a enjoyable event and plenty of happy Anchors going home to their parents. Contact host for venue details. Worcestershire Boys' Brigade Batallion © 2014. All rights reserved. Design by Dave Clarke.